Eagles middle linebacker Jordan Hicks celebrates after the Eagles beat Washington on Sunday, December 30, 2018 in Landover, MD. 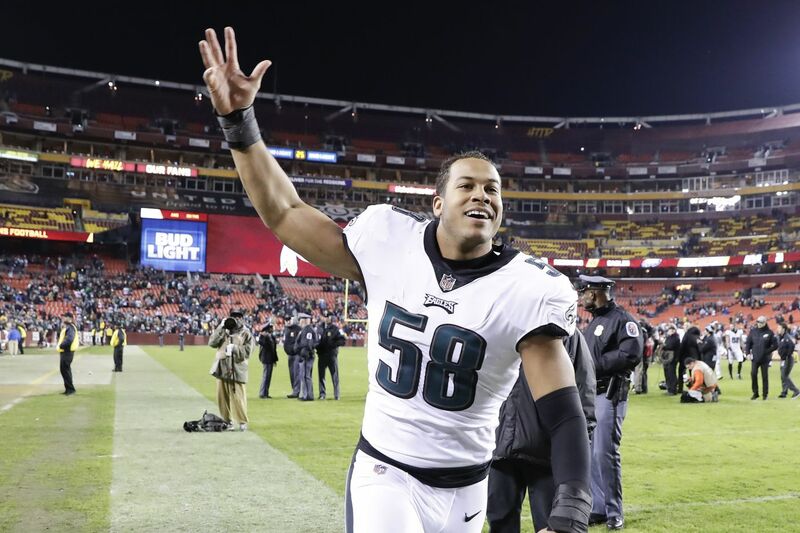 Jordan Hicks will take the field for an Eagles playoff game Sunday, the first time Hicks has done that in his four-season NFL career. Hicks was not listed on the Eagles’ injury report Friday, for the first time in nearly two months. That’s significant, for a talented middle linebacker who has battled injuries ever since he was a Texas Longhorns standout. Hicks has missed 21 of a possible 64 regular-season games as an Eagle. “Pretty special, knowing everything I’ve battled through, and this team has battled through, to get to this point. Specifically me, coming off last year, coming off this injury here, it’s going to be very special to be playing this week,” Hicks said Friday. Hicks missed last year’s Super Bowl run after suffering an Achilles tear in Week 7. Eagles left tackle Jason Peters entered the NFL 15 seasons ago. Like Hicks, he missed the Super Bowl run, Peters with a knee injury. Peters has appeared in three playoff games in his career, but will be looking to win one for the first time, Sunday in Chicago. When Hicks suffered a calf injury Nov. 18 at New Orleans, it ruined his latest attempt to show he could stay healthy, as he looks at possible free agency this coming offseason. Hicks said he was given a four-to-six-week timetable, and resolved to be back in four weeks, which he was. He was a part-timer against Houston and Washington, but Hicks seems ready for more work this week, if that’s defensive coordinator Jim Schwartz’s plan. A solid postseason stretch could affect those contract prospects. Eagles defensive tackle Fletcher Cox and center Jason Kelce were named to the Associated Press All-Pro team Friday, the fourth such honor for Cox and the second for Kelce. They were the only Eagles to make the 28-member group, 14 players chosen from the AFC and 14 from the NFC. Kansas City tight end Travis Kelce, Jason’s brother, joined him on the team. One player who surprisingly didn’t make it was Eagles tight end Zach Ertz, despite setting the record for most catches by a tight end with 116. As expected, the Eagles ruled out for Sunday corner Sidney Jones (hamstring), special teams linebacker D.J. Alexander (hamstring), wideout Mike Wallace (ankle), and quarterback Carson Wentz (back). Corner Avonte Maddox (oblique) and left tackle Jason Peters (quadricep) were among a group listed as questionable, all of whom are expected to play. … Maddox, first named on the injury report Thursday, said he was fine. … Rookie tight end Dallas Goedert, from Britton, S.D., will make his playoff debut. “I got quite a few family coming out; it’s the closest game we’ve played to home (10 hours)… There’s probably about 30. A lot of family, a lot of family friends, a couple coaches, I think,” Goedert said. At South Dakota State, he always got home for the holidays, but that was not the case this year. “It’s been quite a while since I’ve seen some of my cousins and aunts and uncles and stuff,” Goedert said.